This historic 4 bedroom/3 bath home has been recently renovated with a large addition on the rear of the home, and is located in the Fry Springs neighborhood close to Grounds at The University of Virginia. This home is a UVA football fan's dream! You're within walking distance to UVA's Scott Stadium at under a mile away. Not only that, Jefferson Park is a short drive to The Corner or Downtown Charlottesville to partake in some of Charlottesville's best restaurants. If you're bringing your pup (under 50 lbs., please), Azalea Park is a quick walk just south of Jefferson Park! 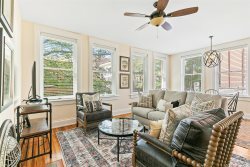 Being near Scott Stadium and UVA, you can bring the whole family to visit a family member or friend in Charlottesville, enjoy the back patio, the TV room with plush leather couches downstairs, or the sitting room on the main level! You have plenty of space for the family to enjoy visiting with one another or for some UVA grads to reunite, reminisce, and make new memories in Charlottesville. The main level features a cozy sitting area that opens up to the dining room table and a remodeled kitchen with stone countertops and all new appliances! The master bedroom is located down a short hallway towards the back of the house and has a king sized bed and a sitting area with a TV. The master has a lot of beautiful natural light and tall ceilings; the private balcony over the backyard make this room an ideal place to relax and read a great book in an Adirondack chair. The master has its own en suite bathroom with a spacious tiled shower with double shower heads, separate bathtub, and double sink vanity. The second floor features 2 bedrooms with queen beds and 1 bedroom with twin beds. Each room has ample light and each has a closet in the bedrooms. A full bath with a standup shower is located on the second floor. If you are needing another full bathroom, there's another located on the terrace level! The terrace level has a large living room space with leather couches and a large flat screen TV - perfect for your group to gather and relax (or celebrate!) The sliding doors open up to the outdoor patio that include an outdoor dining table and charcoal grill. On this level, there is a third full bathroom with a standup shower and a laundry room. Master Bedroom: King Bed with En Suite Bath including Walk-in Shower with Double Shower Heads, Bathtub, and Double Sink Vanity. Tall ceilings, Flat Screen TV, and a Balcony Overlooking Backyard. I needed to add a night to the beginning of our stay and worked with Kate to add the night to our reservation at the correct rate. She was very helpful! House is beautiful, although it did have a lot of stairs that we had to take bags up and down. I appreciated that all the rooms were well-designed since they were not all of equal size, that helped make it feel like everyone had a very nice room. The house was better than we could have imagined for our stay in Charlottesville - clean, cozy, and plenty of space for eight people to sleep comfortably. It's certainly in a walkable area (although we did not walk because of the chilly weather). Would definitely book again. We (a big ole family) had a blast staying here - cooking meals, walking to Azalea Park, watching the Final Four, and cheering a cousin/son/brother on in the Charlottesville Marathon! Can't wait to come back. Thank you! Our family had such an amazing visit, the house is perfect! The home had everything we needed and more, it was beautiful!! Thank you so much, we hope to come again!